Lactic acid bacteria (LAB) being probiotics act as starter cultures in a variety of traditional food preparations. They possess the capability to produce antimicrobial compounds such as hydrogen peroxide, diacetyl, organic acids and bacteriocins. Bacteriocins in recent years have gained interest as a natural preservative in the production of food to enhance shelf life. The present study aims to isolate lactic acid bacteria with bacteriocin producing capability, from piyush and aagal. 10 samples of piyush & 10 aagal samples from different areas in and around Mumbai were screened for the presence of lactic acid bacteria. Bacteriocin producing LAB was isolated from Piyush. The isolate was found to be a Gram positive cocco bacillus, oxidase positive and catalase negative. The cell free supernatant of the isolate showed antimicrobial activity against the common food borne pathogens S.aureus, S.typhi, E.coli, K.pneumoniae, C.sakazakii, Pseudomonas and L.plantarum. It showed highest activity against the food pathogen Cronobacter sakazakii. The bacteriocin was precipitated using 1N HCl. It was found to be stable at 100ºC for 60 min and its activity was highest under acidic conditions. It was affected by proteolytic enzyme (trypsin). The bacteriocin was able to reduce the growth of pathogens when applied to food product (pedha). Further study of bacteriocin may be carried out to explore the possibility of its use as a food bio preservative for enhancing the shelf life of food products. Lactic acid bacteria, Bacteriocin, Aagal. In 2013, 818 food borne disease outbreaks were reported, resulting in 13,360 illnesses, 1,062 hospitalizations, 16 deaths, and 14 food recalls. The investigations showed the cause of these outbreaks included food pathogens like Salmonella, Shigella, E. coli, V. cholerae, and Listeria . Food borne infections are common public health problems which result from the presence of microbes or microbial toxin or indigenous toxic substances that contaminate the food. A variety of chemical and physical preservation techniques have been used to reduce food spoilage and to increase the shelf life of the food product. In spite of the availability of these methods, preservation of food is yet of great public concern as these methods makes the foods unsafe for human consumption. In recent years there is an increasing trend to use biopreservatives in the form of protective cultures or their metabolites, i.e., enzymes and bacteriocins. Biopreservation refers to the use of antagonistic microorganisms or their metabolites to inhibit or destroy undesirable organisms in foods. LAB have been exploited for years for the production of fermented foods due to their ability to produce desirable change in taste, flavor and texture as well as inhibit pathogenic and spoilage microorganisms . They are widely distributed in different ecosystems and are commonly found in foods (dairy products, fermented meats and vegetables, sourdough, beverages), sewage, on plants and also in the genital, intestinal and respiratory tracts of man and animals . LAB are generally considered beneficial microorganisms, with some strains even considered to promote good health (probiotic), and their extensive historical use contributes to their acceptance as being GRAS (generally recognized as safe) for human consumption . A number of different factors have been identified to contribute to the antimicrobial activity of LAB. These bacteria produce different antimicrobials such as lactic acid, hydrogen peroxide, carbon dioxide, acetic acid and bacteriocins, which can inhibit pathogenic and spoilage microorganisms enhancing shelf life . Bacteriocins are peptides released by bacteria which have bacteriostatic or bactericidal activity against related or unrelated organisms. The application of bacteriocin in food industries can extend shelf life of foods. It provides extra protection during temperature abuse conditions, decrease the risk for transmission of food-borne pathogens through the food chain, reduce the economic losses due to food spoilage, reduce the application of chemical preservatives, and permit the application of less severe heat treatments without compromising food safety. Bacteriocins also enhance the preservation of food nutrients and vitamins, as well as organoleptic properties of foods and permit the marketing of novel types of foods. The most prominent Class I bacteriocin, Nisin is the only one internationally accepted as food biopreservative in certain industrial applications. Recently, pedocin is also another commercially available bacteriocin preparation for food applications and the present studies foresee that the count of these preparations would drastically increase in the near future . Studies show that Lactic Acid Bacteria possess the ability to produce bacteriocins. Bacteriocins can be used as a food preservative. LAB being a probiotic can be inoculated along with bacteriocin in the foods. This study will help in isolation of LAB with greater antimicrobial activity and thus the production of novel bacteriocin. The results of this study will be a boon to the food industries in the area of food preservation. Thus the objective of the study was to isolate LAB producing bacteriocin from Piyush and Aagal (Kokum concentrate), indigenously used food products of Maharashtra. The study was carried out in the Department of Food Science & Nutrition at SNDT Women’s University, Juhu.10 Piyush samples were procured from different places of Mumbai and 10 samples of Aagal were collected from different locations around the western region of Maharashtra. The samples were kept at refrigerated temperature until analysis. 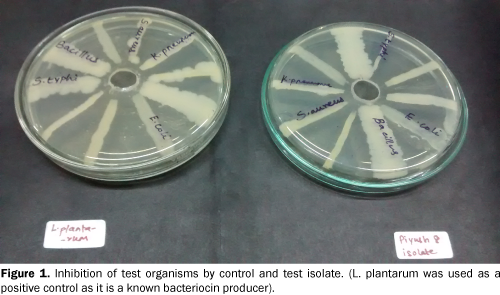 All the cultures i.e., Staphylococcus aureus, Bacillus, E. coli, Klebsiella, S. typhi, C. sakazakii , L. plantarum ATCC 8014 , used for the project work were standard strains obtained from NCIM, Pune. The samples were serially diluted using sterile saline and then plated on to respective media by pour plate method. The results for total plate count were recorded after incubation of 24 hrs at 37ºC whereas the LAB count and total yeast mold count were recorded after 48 hrs of incubation at room temperature. The isolated LAB would be grown in MRS broth under anaerobic conditions . Antimicrobial assay was carried using well diffusion method . In well diffusion assay, wells were prepared on Mueller Hinton agar using a sterile cork borer. The test organisms were streaked across the well and the antimicrobial assay was carried out. The test organisms used were S. aureus, E. coli, Bacillus, Klebsiella, Pseudomonas, Cronobacter sakazakii and S. typhi. The wells were loaded with 0.1 ml of cell free supernatant (CFS). The antibacterial activity was measured in terms of zone of inhibition . Antimicrobial assay of L.plantarum ATCC 8014 was spectrophotometerically determined at 600 nm . The bacteriocin was purified using ammonium sulfate precipitation, Trichloroacetic acid (TC) precipitation [7,9]. The cell free supernatant produced was treated with solid ammonium sulphate with 90% saturation. The mixture was stirred for 2h and kept at 4ºC. Then it was centrifuged at 2500 rpm for 15 minutes. The precipitates were re-suspended in 25 ml of 0.05 M phosphate buffer (pH 7.0). Assay of the bacteriocin activity was carried out in both the precipitate and supernatant to know which one actually contains the bacteriocin. The cell free supernatant was mixed with Trichloroacetic acid for precipitation. The mixture was centrifuged at 13,000 rpm for 10 minutes after which the supernatant was decanted. The resulting pellet was dissolved in phosphate buffer. The cell free supernatant was treated with 1N HCl until saturated and kept at 4°C overnight. The CFS was then centrifuged at 2000 rpm for 20 min and the precipitate and supernatant was separated and checked for antimicrobial activity. The bacteriocin precipitation was achieved by acid precipitation using 1N HCl. The cell free supernatant was added to the wells on the agar seeded with S.aureus, E.coli, S.typhi, K.pneumoniae and the zones of inhibition were measured  (Table 1). Table 1:Inhibition of various indicator organisms by isolated bacteriocin. Thermal sensitivity of the bacteriocin was studied by heating the CFS at different temperatures - 55ºC, 60ºC, 70ºC, 80ºC 90ºC, 100ºC and the antimicrobial assay was carried out using the positive test organisms. Similarly the CFS was treated at 100ºC for 10, 20, 30,40,50,60 minutes. The CFS was adjusted at a range of pH –1, 2, 3, 4, 5, 9, 11 using 1N NaOH & 1N HCl. and the antimicrobial assay was carried out using the positive test organisms. The cell free supernatant was checked for sensitivity towards trypsin at varied concentrations and incubated at 37°C for 2 hours and heated at 100°C for 5 min to denature the enzyme. Both the control and the samples were assayed for antimicrobial activity . 5g of Pedha was inoculated in 50ml of buffered peptone water. This was inoculated with 106 cells/ml of S. aureus. The test bacteriocin was then added to observe the effect of bacteriocin on S. aureus in pedha. This was serially diluted up to 10-4 dilution and were plated on plate count agar and incubated at 37ºC for 24hrs. The colony count was recorded and compared with the control (without bacteriocin) . Gram staining, catalase & oxidase tests were carried out for the isolate. Piyush and aagal samples were screened for LAB. 11 isolates from 10 piyush samples & 6 isolates from 10 samples of aagal were isolated using MRS agar. These 17 isolates were tested for antimicrobial activity and the isolate from piyush showed the best antimicrobial activity. This positive piyush sample (P8) was obtained from Potoba Restaurant, Mahim. The cell free supernatant of the isolate showed antibacterial activity against S.aureus, E.coli, S.typhi, K.pneumoniae except Bacillus (Figure 1). Also the antibacterial activity was observed against Pseudomonas, C. sakazakii and L.plantarum ATCC 8014. Figure 1: Inhibition of test organisms by control and test isolate. (L. plantarum was used as a positive control as it is a known bacteriocin producer). The zone of inhibition for C. sakazaki was seen to be highest then that of K.pneumoniae which showed least zone of inhibition. Bacteriocin precipitation was achieved through acid precipitation by using 1N HCl. The supernatant showed antimicrobial activity and the precipitate did not showed activity. This showed that the isolated bacteriocin is peptide in nature. The isolated bacteriocin was found to be stable at 100ºC for 60 min. It was also observed that when CFS was heated for more than 40 min; its activity against K.pneumoniae was decreased. The cell free supernatant of the isolate was found to be active under acidic conditions since the inhibition was observed at pH 1 to 4 and not at pH 5, 9, and 11. The antibacterial activity of bacteriocin from the isolate was completely inhibited by proteolytic enzyme trypsin at concentration of 2000 u/g indicating that isolated bacteriocin is proteinaceous in nature. The preservative effect of partially purified bacteriocin was observed (Table 2). There was a reduction in the total bacterial count in the sample treated with bacteriocin compared to that with the control (without bacteriocin). Table 2: Microbiological and biochemical characteristics of the P8 isolate. Bacteriocins from Lactic acid bacteria are been used as a bio preservative because of their antimicrobial and heat stable nature. In the present study, lactic acid bacteria were isolated from piyush and aagal. The isolation of LAB from aagal was difficult may be due to its innate antimicrobial properties. Sutar et al. has reported that the antimicrobial activity in kokum extracts was due to presence of furfural . But LAB was isolated from the fruit, juice and phyllosphere of Kokum . Bacteriocin from piyush was isolated with wide spectrum of activity showing largest zone of inhibition against the food pathogen C. sakazakii. Even though the bacteriocin inhibited S. aureus, it failed to inhibit Bacillus. Gupta and Tiwari  reported that plantaricin LD1 showed a broad spectrum activity that inhibited both Gram-positive and Gram-negative bacteria including food-borne pathogens . Agaliya and Jeevaratnam isolated 8 strains of LAB from idli batter which showed maximum zone of inhibition against other LAB and various Gram positive and Gram negative pathogens . The bacteriocin was precipitated using 1N HCl whereas Ogunbanwo et al., carried out the bacteriocin precipitation through ammonium sulphate and TCA precipitation. The specific activity increased to 85.3 and 44.4 AU/g protein for L. plantarum F1 and L. brevis OG1 respectively . The effect of heat and pH were studied on the isolated bacteriocin. It was stable up to 100°C for 60 min and found to be pH dependent (pH 1 to 4). The bacteriocin produced by L. brevis OG1 was found to be stable at temperature 121°C for 60 min & at pH 2 to 8, while for L. plantarum F1, it was found to be heat stable at 121°C up to 90 min and at pH 2 to 6 .The bacteriocin isolated from piyush lost its activity when treated with enzyme trypsin. The antimicrobial activity of the bacteriocin produced by L. brevis OG1 and L. plantarum F1 was lost when treated with proteolytic enzymes . The bacterial counts with bacteriocin (3.94 × 104 cfu/gm) when compared to those with S.aureus (7.06 × 104 cfu/gm ) and the normal flora of pedha (4.84 × 104 cfu/gm), there was a reduction in the count. This showed that the bacteriocin can be a potential food preservative. Chopra et al., carried a similar experiment with sonorensin coated packaging films. It was observed that the spoilage of meat samples occurred in control films whereas no spoilage was observed in sonorensin packaged samples . The microbial counts drastically decreased when treated with partially purified bacteriocin from isolate KN02, in milk and edible button mushrooms . This bacteriocin producing isolate was Gram positive cocco bacillus, oxidase positive and catalase negative. Elyas et al. identified 40 strains isolated from seven Sudanese fermented foods. All the isolates were Gram-positive, catalase negative, nonendospore forming, and produced acid from glucose. Thus they were presumptively identified as lactic acid bacteria . In conclusion, this study reveals that the bacteriocin from the piyush isolate possess a wide spectrum of antimicrobial activity against the common food pathogens. It is heat resistance and has a bio preservative effect as studied on pedha. This study thus concludes that the bacteriocin from the isolate can be used as food preservative and a potential probiotic. Further research of this bacteriocin such as optimizing growth conditions for maximum bacteriocin production, purification and characterization could help us to identify novelty of the bacteriocin. FDA. Food safety modernization act. proposed produce rule, 2014. Suslow, T. Post-harvest chlorination basic properties and key points for effective disinfection University of California, Division of Agriculture and Natural Resources, 1997. Suslow, T. Chlorination in the production and postharvest handling of fresh fruits and vegetables., 2015. Guide to minimize microbial food safety hazards for fresh fruits and vegetables. 1998. Suslow, T. V. Oxidation-reduction potential (ORP) for water disinfection monitoring, control and documentation. Regents of the University of California, Division of Agriculture and Natural Resources, 2004. Magnone J, et al. Additive approach for inactivation of E. coli O157:H7, salmonella spp and shigella spp. on contaminated fresh fruits and vegetables using bacteriophage cocktail and produce wash. Journal of Food Protection, 2013. Lopez-Velasco G,et al. Chlorine dioxide dose, water quality and temperature affect the oxidative status of tomato processing water and its ability to inactivate salmonella. Food Control, 2012;28-35. White's handbook of chlorination and alternative disinfectants, 5th edition is a truly comprehensive and up-to-date handbook.(report). Pharma Business Week, 2010;4296. Clesceri LS, Arnold GE, Rhodes TR. American Public Health Association, American Water Works Association,Water Pollution Control Federation. Standard methods for the examination of water and wastewater. Washington, DC: American Public Health Association, 1989. Palin AT. Current DPD methods for disinfectant residual measurement. Current DPD methods for disinfectant residual measurement. Journal of the Institution of Water Engineers and Scientists, 1986;40. Beuchat LR, et al. Standardization of a method to determine the efficacy of sanitizers in inactivating human pathogenic microorganisms on raw fruits and vegetables. Journal of Food Protection, 2001;64:1079-1084. Parish ME, et al. Methods to Reduce Eliminate pathogens from fresh and fresh-cut produce. Comprehensive Reviews in Food Science and Food Safety, 2003;2:161--173. Shen C, et al. Dynamic Effects of Free Chlorine Concentration, Organic Load, and Exposure Time on the Inactivation of Salmonella, Escherichia coli O157:H7, and Non-O157 Shiga Toxin-Producing E. coli. Journal of Food Protection, 2013;76:386-393.